Creating a proper dining area in your home is so important, and you definitely don't need a specific 'dining room' to be able to do this. If you're smart with furniture and layout, you should be able to create the space for a table in most homes (I even managed to have one in the tiny one bedroom flat I lived in a few years ago!) Aim for a space that's practical while still looking great, somewhere you can eat your everyday meals as well as host dinner parties and invite family round for special occasions. Here are a few of my tips and design ideas! The bigger your space the more adventurous you can be here, but even small kitchens and living rooms can feature a dining table if you choose well. 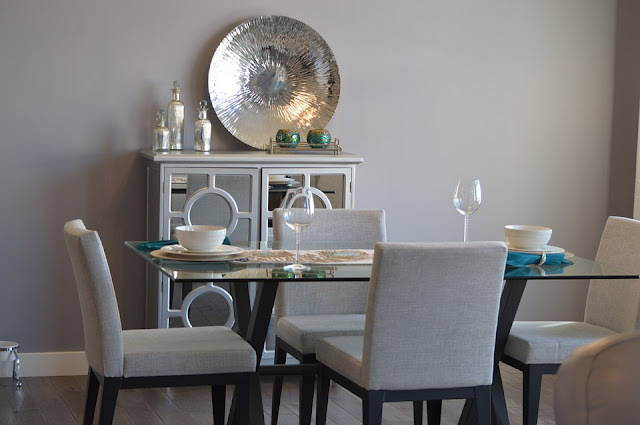 If you have furniture like sideboards or armchairs that aren't used very often you could take them out completely and make space for a dining table instead. You could go with a smaller table with clear/ ghost chairs, or choose a space saving set like this. If you live alone or as a couple and simply need a practical dining space, go for a table and chairs designed for two people. Don't feel as though you need to buy your table and chairs as a set (although this will probably work out a bit cheaper), if you can't find exactly what you're after then choosing the table and chairs separately will give you more options. Be sure to measure everything out carefully before investing in dining furniture, accounting for the space you'll need around the table to pull all of the chairs out. Good lighting is essential, overhead lighting above the table especially will really finish off a dining space making it look complete. Whether it's a trio of ultra modern pendants, a statement piece or a chandelier for the ultimate in elegance and style. I'm obsessed with chandeliers and have a few of them throughout my home; you can pick up a ready-made one or for something a bit more special you can have your chandelier custom made. To find out more about this check out www.chandeliergroup.com and have a browse. One of the best ways to add a sense of style and personality to a room is by adding art and accessories. There are loads of fun and quirky things you can get specifically for a dining space- teapot lamps, cutlery clocks, plaques etc. Alternatively you simply could go with frames and art that ties in with the rest of your home. A table runner, place mats and a good centrepiece will finish off the table itself. Hardwearing flooring is essential in any well used area in my book, especially for somewhere like a dining space where you have the possibility of food and drink spills. One glass of red wine goes over or someone drops a plate, then you're stuck forking out for expensive carpet cleaners. They might be cosy but I always think carpets are best saved for the bedroom, you can always turn up the comfort factor of a wooden floor by adding a rug or even having underfloor heating installed. Thinking of making the switch from carpets to hardwood floors? Have a read of www.flooring.com. Do you have a dining area in your home?